Sweet Sixteen Sleeper (#12 seed or lower): #14 Belmont (27-7, 16-2 Atlantic Sun). There are a couple of good sleeper options in this region. The winner of the #12 play-in game between Cal and South Florida could have a chance to take out Temple in round one. And #13 Ohio has a dream matchup with #4 Michigan. But as a believer in both the Owls and Wolverines, I have a hard time believing either team is going to lose its first game. Looking even deeper, #14 Belmont has an opportunity to be a serious sleeper. The Bruins have quietly handled their business after being a preseason mid-major to watch. Remember that they lost by one point at Duke in Cameron Indoor Stadium in November. Months later, they’re the Atlantic Sun champions and match up with Georgetown, a team that has been bounced in the first round in each of the past two seasons, including as a #3 seed in 2010. It seems unlikely that the Hoyas will suffer the same fate again, but they get a very difficult matchup here for the potential upset. 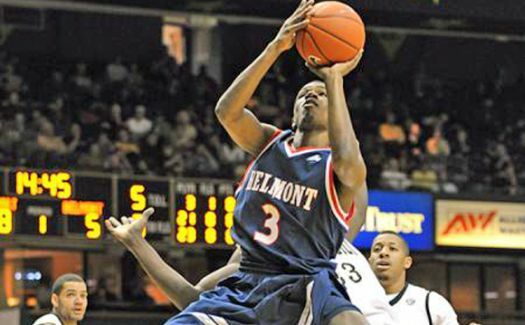 Belmont is the third-most efficient offensive team in the country and capable of making the Sweet Sixteen. Final Four Sleeper: (#4 seed or lower) #5 Temple (24-7, 13-3 Atlantic 10). It’s tough to pick a Final Four sleeper in this region that has UNC on one side of the bracket and KU on the other end. But if something crazy happens, the Temple Owls have the potential to emerge. This is a veteran team with great guard play that’s been to the Big Dance for four straight years and just hasn’t been able to break through with a big run. This could be Fran Dunphy’s year, led by the tremendous trio of scoring guards – Ramone Moore, Khalif Wyatt, and Juan Fernandez. Carmelo Anthony Award: Thomas Robinson, Kansas. Looking for one player that could take this region by storm and lead his team to the Final Four? Why go any further than the National Player of the Year frontrunner, Robinson? He’s the main reason why this Kansas team has overachieved all season long, averaging nearly 18 points and 12 rebounds per night. One of the most physically overpowering players in the country, Robinson has the ability to lead this team to great heights in what’s probably his last run in a Kansas uniform. Stephen Curry Award: Matthew Dellavedova, St. Mary’s. How about a player from a mid-major school with the goods to take his team on a Cinderella run? Well, St. Mary’s is far from an unknown commodity — the Gaels have been a ranked team for much of this season and won both the WCC regular-season and conference tournament over Gonzaga. But St. Mary’s remains a mid-major with a fairly low seed, playing in the same #7-#10 matchup that Steph Curry once started his run with for Davidson. Dellavedova is our guy here, the WCC Player of the Year who averages 15.6 points and 6.4 assists per night with strong shooting splits (45% overall/36% three/85% free throw). Dellavedova was a major contributor as a freshman when the Gaels made their Cinderella run to the Sweet Sixteen in 2010, and he’s capable of leading another such run this year. Home Cooking: #2 Kansas, 191 miles from Omaha, 231 from St. Louis. Yes, North Carolina is headed to its backyard in Greensboro for the opening two rounds. But the regional semifinals and finals in this bracket are being played in St. Louis, a much quicker drive for Kansas than North Carolina should both teams end up advancing that far. Kansas also gets to play in Omaha in its first weekend of games. This sets up very well for the Jayhawks. Can’t Miss First Round Game: #6 San Diego State vs. #11 NC State (Friday, March 16). 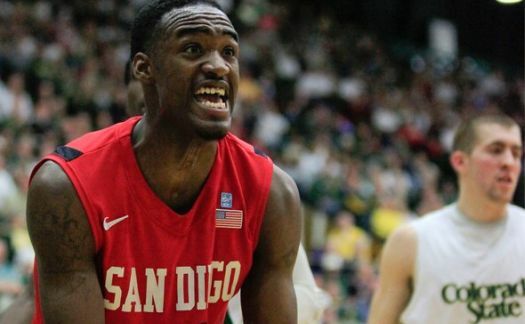 San Diego State has overachieved all year thanks to Mountain West Player of the Year Jamaal Franklin’s development into a star alongside guard Chase Tapley. But this duo has to provide so much production for the Aztecs that it makes them vulnerable to an upset against a strong offensive opponent. NC State has been putting up plenty of points recently, averaging 71.8 points per game in its last five games, all of which were crucial games. This will be a fun one to watch that could end up in an upset. Don’t Miss This One, Either: #4 Michigan vs. #13 Ohio (Friday, March 16). How about some love for the Wolverines? Michigan was a co-champion of the Big Ten regular season thanks to an improving defense and the time-tested John Beilein offense that thrives on shooting from the perimeter. Freshman Trey Burke has made the operation go as one of the surprise rookie stars in the country. But Michigan draws Ohio, a team whose single best trait is its ability to defend the three-point line. That’s exactly what you need to do to beat Michigan. The Bobcats played at Louisville in the non-conference and nearly won before falling in overtime. D.J. Cooper and company are thinking upset. This is a must-watch game for the contrast in styles. Lock of the Year: Chalk in the Regional Final. The main themes we see developing in this region are that there are plenty of juicy first-round matchups with upset potential, but also that there are no teams that look to be serious threats to the two top seeds. Every team seeded #3-#6 is capable of being upset, which directly correlates to the idea that North Carolina and Kansas are near locks for the Elite Eight. With both playing so close to home in the first two rounds and the clearly superior talents in their pods, it would be a shocker if we don’t see both of these teams in the Sweet Sixteen. From there, both will be heavy favorites in those games as well. UNC and KU are on a crash course for the Regional Final in St. Louis. 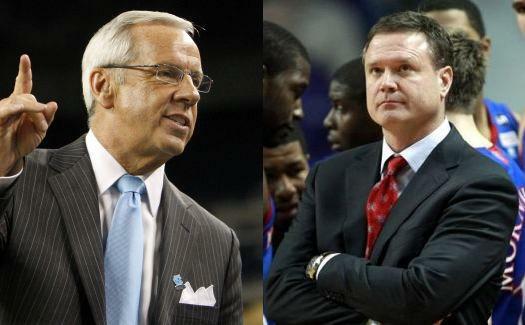 Juiciest Potential Matchup – media: #1 North Carolina vs. #2 Kansas in the Elite Eight. Like we keep saying, this is the matchup to look out for, and it happens to be a salivating one for the media world. #1 seed vs. #2 seed. Roy Williams against his former team. A rematch of the 2008 Final Four matchup, the year that Kansas won it all. Two of the storied, juggernaut programs in basketball history. The media would eat this one up, and we wouldn’t blame them. Juiciest Potential Matchup – purists: #3 Georgetown vs. #4 Michigan in the Elite Eight. So what happens if the top teams do happen to go down? No worries, there are plenty of other intriguing matchups in the works. This one between two old school offensive schemes and respected coaching gurus would be a special one for the basketball purists. Should this matchup come to fruition, you could make a drinking game out of the number of times the phrase “backdoor cut” is used during the telecast. 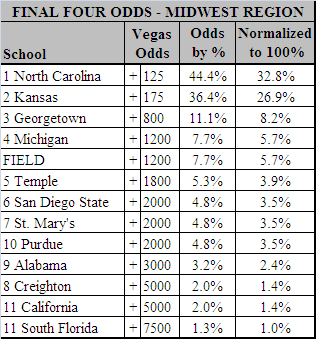 We Got Screwed: #8 Creighton (28-5, 14-4 MVC). Not only were they underseeded, but the Bluejays also got jobbed with their draw. First, Creighton has a tough matchup with #9 seed Alabama, a team with the exact kind of slow-paced, defensive style that it hates to play against. And a win there would reward Creighton with… North Carolina. No love for Doug McDermott and the Missouri Valley champs, who would have to pull off a massive upset to get to the Sweet Sixteen. How Fun Would It Be If These Two Battled It Out? Strongest Pod: Omaha, with #2 Kansas, #15 Detroit, #7 St. Mary’s and #10 Purdue. Purdue isn’t getting much pub as a potential threat, and we don’t love its chances either, but this is a still a rock solid #10 seed. Every other team here is strong. Even the #15-seed Detroit Titans provide matchup problems with elite guard Ray McCallum and former Indiana transfer Eli Holman. You know what to expect from Kansas, and then St. Mary’s offers the recent experience of a Sweet Sixteen run from the #7-#10 game. This season was a special one for the Gaels as WCC regular-season and tournament champions with the conference Player of the Year on the roster. So-Called Experts: Everyone loves NC State as the sleeper team after its run in the ACC Tournament. Doug McDermott of Creighton matching up against former Ames (Iowa)High School teammate Harrison Barnes of North Carolina in the round of 32 is the special matchup to watch. And nobody will be picking anyone besides North Carolina or Kansas to win the region. At least that’s what the experts are saying. This entry was posted on Monday, March 12th, 2012 at 11:55 am by EJacoby	and is filed under 2012 ncaa tournament, bracket prep. Tagged: belmont, bill self, creighton, d.j. cooper, detroit, Doug McDermott, feature, georgetown, greensboro, harrison barnes, jamaal franklin, juan fernandez, kansas, khalif wyatt, matthew dellavedova, michigan, midwest region, nc state, ncaa tournament, north carolina, ohio, omaha, ramone moore, ray mccallum, roy williams, san diego state, st louis, st mary's, temple, thomas robinson, trey burke. You can follow any responses to this entry through the RSS 2.0 feed. You can leave a response, or trackback from your own site.